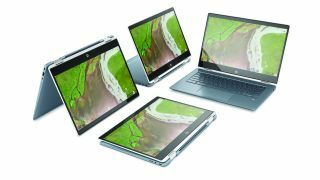 HP has unveiled a new 2-in-1 that the company boasts is the thinnest convertible Chromebook it has ever produced. The Chromebook x360 14 has a 360-degree hinge that offers the usual four hybrid positions – laptop, tablet, tent and stand modes, as illustrated above – with premium design touches including an anodized aluminum keyboard deck, a rear cover with a ceramic-like finish, and a touchpad with diamond-cut trim. The notebook is 16mm thick (and weighs 1.68kg), and is powered by a choice of Intel’s 8th-gen Core i3 or i5 processors (the former is the i3-8130U dual-core CPU clocked at 2.2GHz with boost up to 4GHz). That’s backed with 8GB of system RAM and 64GB of eMMC flash storage. Graphics are integrated on the processor (Intel UHD Graphics 620), and HP promises an impressive battery life of up to 14 hours (claimed). The 14-inch IPS screen has a Full HD resolution and also benefits from a narrow bezel (7.5mm) down the sides which should help maintain that ‘premium laptop’ appearance, too. You get Bang & Olufsen-tuned dual speakers and a pair of USB Type-C ports (capable of piping not just data, but power and a video signal) along with a USB 3.1 connector, and a microSD card slot. Finally, the Chromebook x360 14 comes equipped with a front-facing HP Wide Vision webcam (with an HD resolution and dual array microphones). The hybrid Chromebook is available to pre-order at HP’s online store now, with the price starting at $599 (around £460, AU$850). It’s also up for pre-order at Best Buy and will be available to buy in-store come October 21 over in the US.